The opening shots of the first Taranaki War were fired when British troops attacked a pā built by Te Āti Awa chief Te Rangitāke at Te Kohia, Waitara. A minor chief, Te Teira Mānuka, had offered to sell Governor Thomas Gore Browne land in 1859. Te Rangitāke (also known as Wiremu Kīngi) denied the validity of the sale and his supporters erected a flagstaff to mark their boundary. Gore Browne overturned previous policy by pursuing a contested land sale. He hoped to win support from New Plymouth settlers desperate for land. When Gore Browne ordered surveyors onto the Pekapeka block, Māori pulled up their pegs. The governor declared martial law and sent in British troops. Te Rangitake’s L-shaped pā incorporated anti-artillery bunkers. Built overnight just inside the disputed land, it withstood close-range fire from 500 troops and 200 artillery rounds. No Māori had been killed by the time Te Rangitāke and his 70 men abandoned the pā that night. Māori often constructed L-shaped pā in the 1860s to provoke attack by the British. Though durable, they could be built quickly and so were expendable. The war dragged on until March 1861, with neither side winning a decisive victory. There would be more fighting near New Plymouth in 1863. 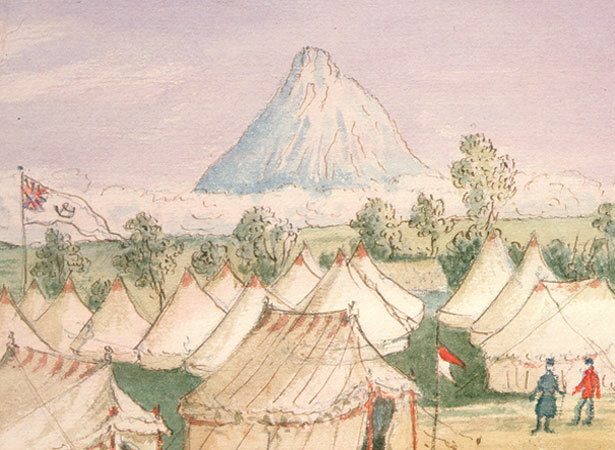 We have 17 biographies, 13 articles, related to First Taranaki War erupts at Waitara.